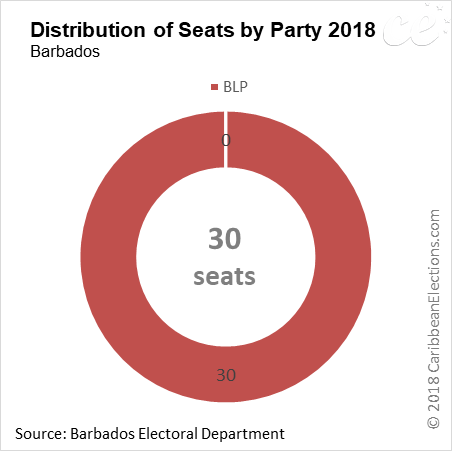 General elections were held in Barbados on 24 May 2018 for all 30 seats in the House of Assembly using a first-past-the-post system. 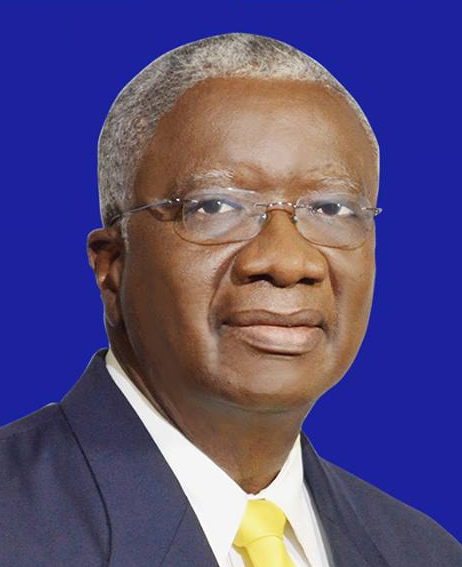 The DLP's handling of the economy over its two terms in office was one of the major issues in the campaign. 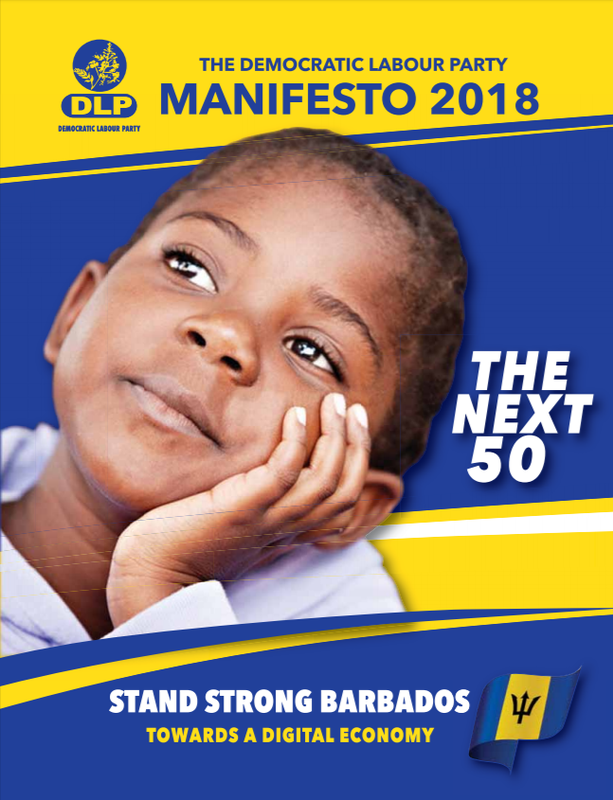 Weak growth in the economy following the 2009 global financial crisis has continued to put strains on Barbados’ public debt, pressuring foreign exchange reserves and helping to spark repeated downgrades of the island’s credit rating. Many voters expressed frustration at the party’s failure to reduce debt and the cost of living even as their taxes rose. 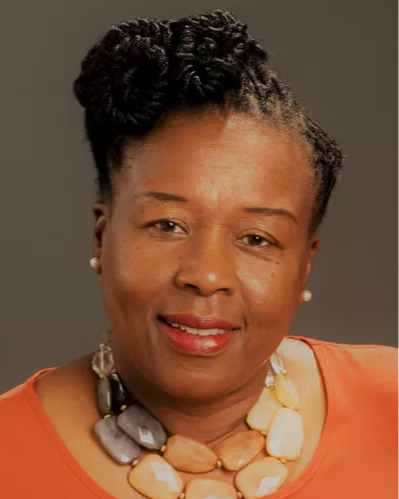 In addition, there was growing concern and adverse publicity and cancelled bookings stemming from a collapsing sewage system on the south coast of the island - one of the main tourist areas. 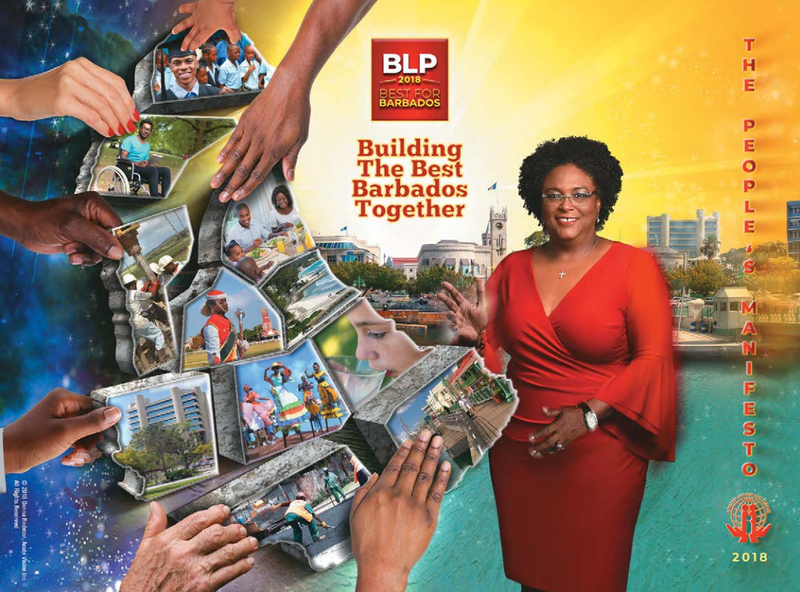 Mottley’s BLP, whose campaign begun in earnest at the start of 2018, attacked Stuart's DLP over taxation and the cost of living, pledging to provide regular garbage collection, more buses for public transportation, and repair potholed roads. 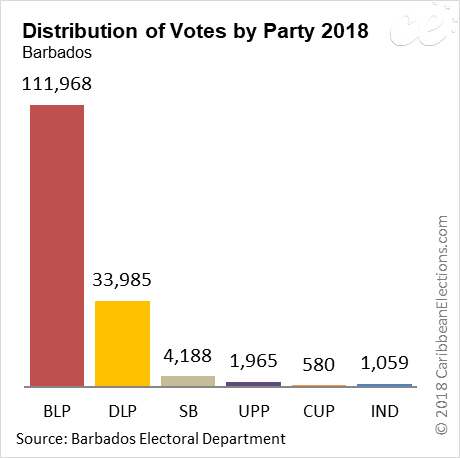 The 2018 election now goes into history as the first election in the post-independence era of Barbados with a clean sweep of seats by a single political party. 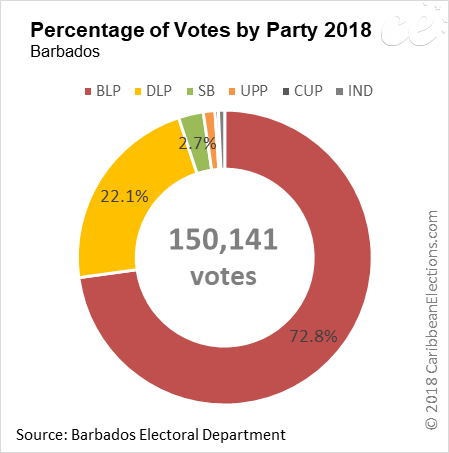 As a result, for there will be no Opposition in the House of Assembly. 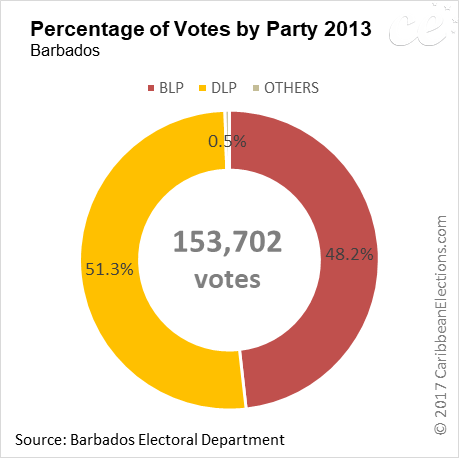 Prior to this the largest majorities were the 26:2 victory for the BLP in the 1999 election, and the 24:3 win in favour of the DLP in 1986. At 12.25 p.m on 25 May 2018, Governor-General, Dame Sandra Mason, swore Mottley into the office. For the first time in its history, both the Governor-General and Prime Minister are women. Dale Marsall was also sworn in as Attorney General on 25 May 2018. This is the second occassion on which Marshall will hold the post. 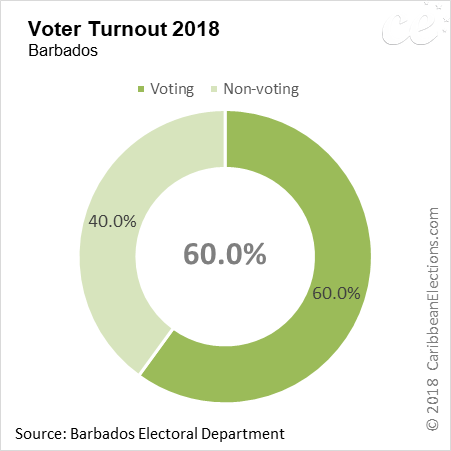 Voter turnout was approximately 60%. 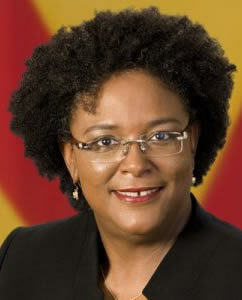 On 26 May 2018, Prime Minister Mottley announced her 26-member Cabinet. 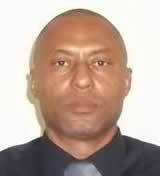 In addition, two Parliamentary Secretaries and two Special Ambassadors who can attend Cabinet meetings were announced. 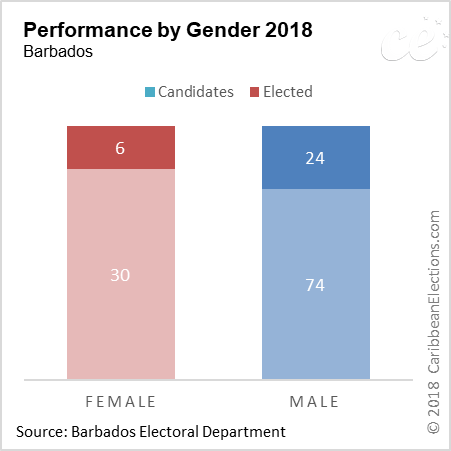 In her announcement, the Prime Minister iindicated that the Cabinet was relatively large because of the mandate received, the scope of the work to be done, and the level of expertise available among elected members. 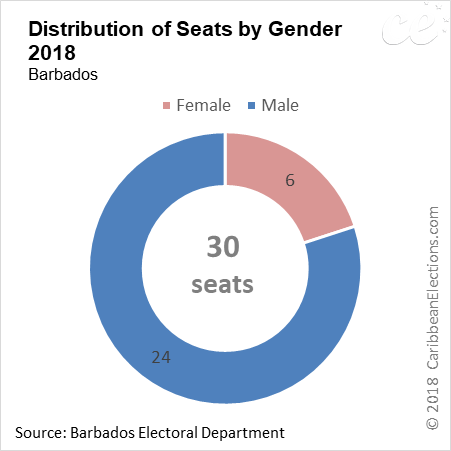 The new Cabinet include seven women, the highest number ever to serve at that level, surpassing the women in the 1994 and 2008 Cabinet of Prime Minister Own Arthur. The Cabinet was sworn in on 27 May 2018. 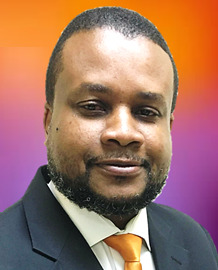 First-time Member of Parliament, attorney at law, Arthur Holder, will be Speaker of the House of Assembly, while Deputy Speaker will be Gline Clarke, and Dr Sonia Browne, another first-timer, will be Chairman of Committees. 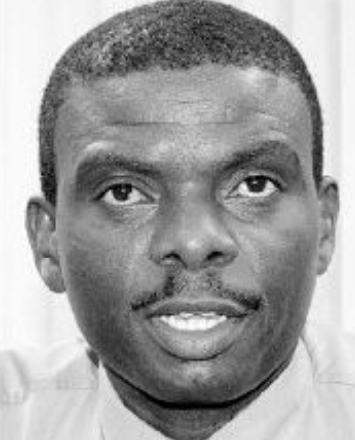 Former minister in a 1990s Barbados Labour Party administration, Sir Richard Cheltenham QC, will be the new President of the Senate, and his deputy will be another former BLP minister, Rudolph “Cappy” Greenidge. 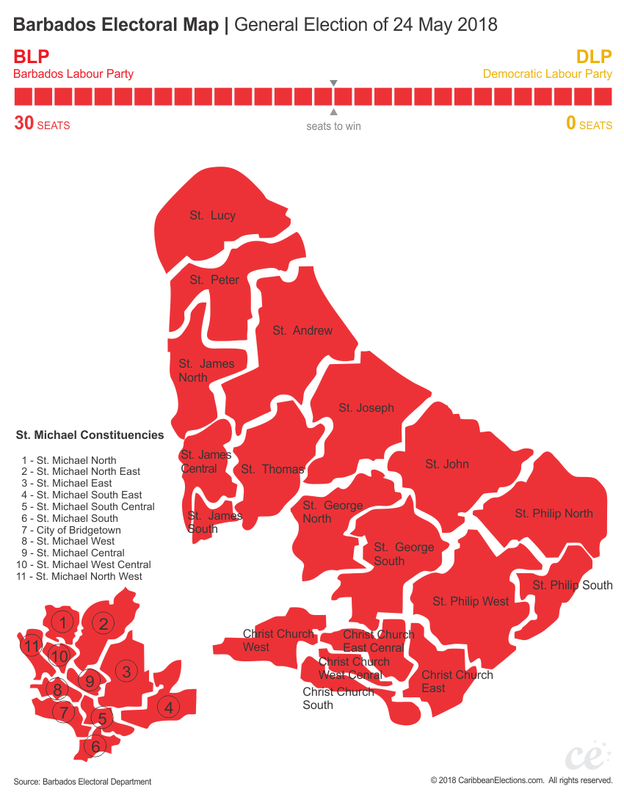 On 31 May 2018, Bishop Joseph Atherley, Member of Parliament for St Michael West, informed Prime Minister Mottley of his intention to serve in Opposition to the BLP Government. 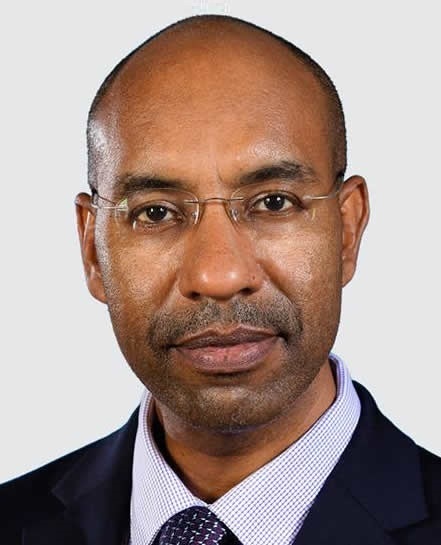 As the only member on the opposiiton benches, Atherely was sworn in as Leader of the Opposition on 1 June 2018.